By now, many Marine Corps Times readers have read the news that the service has recommended that a former Marine corporal receive the Medal of Honor for valor last year in eastern Afghanistan. It’s a story that we first broke last Monday online, citing a Marine source with knowledge of the awards process. It was subsequently confirmed by other Marine sources last week. The circumstances of the case should make it no surprise that former Cpl. 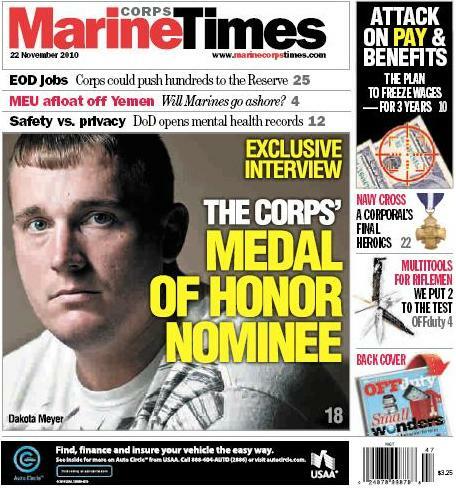 Dakota Meyer, 22, is hesitant to discuss his actions. For the first time since that ordeal, Meyer agreed last week to discuss how he has coped with the incident, what life is like for him now and how he remembers his friends, who gave the ultimate sacrifice. He is uncomfortable with the attention, but said if he can keep the memory of his fellow Marines alive, it’s worth it. well done brother….keep putting one foot in front of the other!! The best of the best. Thank you, Sgt. Meyer. Living strong is a great tribute to your buddies. Please, Dakota, please link up with the vet center. Survivor guilt is quite a weight. I pray in time you can free yourself from those shackles and be free to revel in the time and bonds you all shared. If you haven’t considered it before, I would like to plant the seed. Vet Centers are autonomous from VAMC’s and do not share records. It’s a safe place. I know. Email me if you like.